While the city of Honolulu develops along its rail route, lawmakers get an eye-opening Oahu agriculture update. Oahu’s lush agricultural past and increasingly urban future were juxtaposed on both sides of Punchbowl Street on Wednesday as City Council members at Honolulu Hale and legislators at the Capitol discussed the fate of farmland in Hawaii. Council members began the process of a zone change to allow the long-planned Hoopili residential development to displace 1,289 acres of farmland along the under-construction rail route in west Oahu. Meanwhile, state lawmakers considered a land swap to preserve some agricultural land and the latest estimates of how much of the island’s best growing acreage remains. The information alarmed at least one legislator, who said she was floored by how little was left. 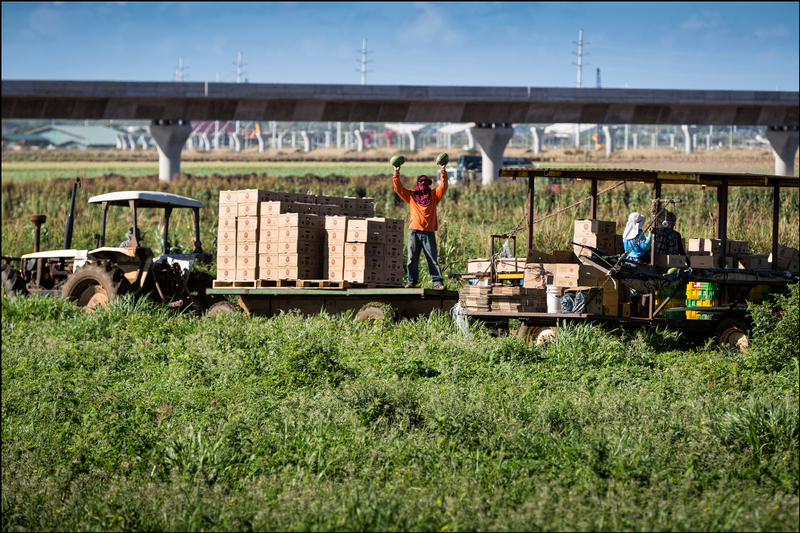 A worker at Aloun Farms holds up freshly picked watermelons near construction of the HART rail project in Kapolei in August 2014. This land is the future site of the Hoopili housing development. Council members voted Wednesday to pass the first reading of a bill to rezone Hoopili from agricultural to various urban districts, taking the first step in approving an 11,750-home development. Wednesday’s vote on Bill 3 was largely a formality, merely kicking off the city’s legislative process of considering the long-debated development proposal. The zone change would pave the way for the developer to apply for building permits and begin construction. It’s been a long time coming for that developer, D.R. Horton, which has spent years getting the project through various state and city approvals in the face of staunch opposition. 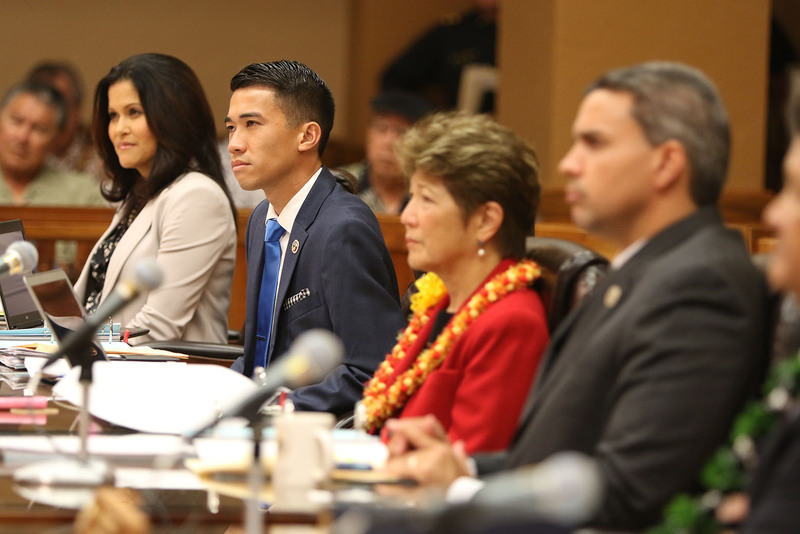 City Council Zoning and Planning Committee Chairman Ikaika Anderson intends to hold two hearings during the first week of March to hear testimony on the housing project. Much of the debate centers around whether the city should allow the developer to pave over nearly 1,300 acres of highly productive agricultural land. A lawsuit by the local chapter of the Sierra Club that’s pending in the state Supreme Court argues that the state has a constitutional obligation to protect the farmland. But Anderson said the decision was made 30 years ago to develop the area when the city drew up the Oahu General Plan and decided to designate Kapolei as the “Second City,” rather than Kahaluu on the Windward Coast. Honolulu City Council members listen to testimony Wednesday. The land where the planned Hoopili development sits is within the city’s urban growth boundary. “We would lose more than three decades of planning if we revisit (that decision),” said Anderson, who supports Hoopili. The councilman said that he is open to changing his mind, but prospects don’t look good for critics who see the project as a roadblock to achieving food security and preserving open space on Oahu. If the City Council approves Bill 3, it will merely add to the city’s pattern of urbanizing farmland, he said. 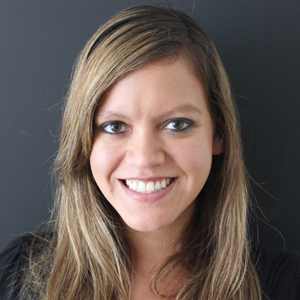 “It goes against all the principles of good planning that I studied,” Minerbi said. While council members at Honolulu Hale seem poised to embrace yet another development on farmland, across the street state lawmakers are grappling with how to preserve agricultural land in central Oahu. Two Senate committees voted to approve a bill that would set aside money to investigate the possibility of the state swapping land in Kalihi for agricultural and conservation land in central Oahu owned by Dole Food Company. The state Office of Planning testified that only 67,000 acres on Oahu — or 17.5 percent of the island — is made up of land classified as agricultural that has a slope of 20 percent or less. That doesn’t include Hoopili, which won the state’s approval to change its land classification from agricultural to urban three years ago. An Office of Planning map analyzes available farmland on Oahu. Meanwhile, 27 percent of the island has been urbanized, compared to less than 5 percent statewide. Senate Water and Land Committee Chairwoman Laura Thielen said she was floored by the analysis. “I had no idea that the island had gotten to that point,” said Thielen, who chaired the state Department of Land and Natural Resources under Republican Gov. Linda Lingle. The Office of Planning’s analysis doesn’t take into account land that is classified as agricultural but is being used for other purposes, such as luxury housing or solar farms. Rodney Funakoshi, a program planning administrator at the Office of Planning, said that the agency is still in the process of figuring out how much agricultural land has been converted for other uses. Other factors that might diminish the amount of land that’s available for farming include the availability of water and the price of leasing the land. 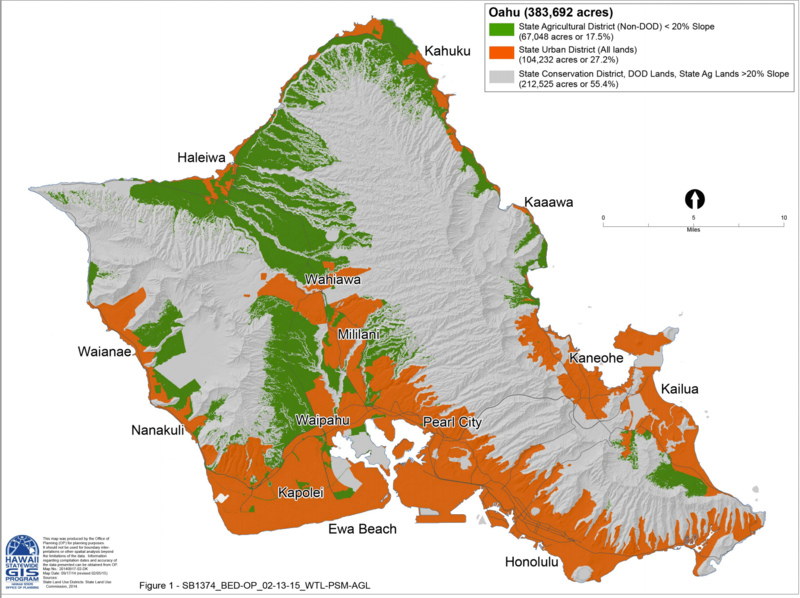 Thielen sees the data as impetus for finding a way to conserve more farmland in central Oahu. But the information also provides fodder for City Council members as they mull the question of Hoopili. Opponents of the Hoopili development often point out that about 90 percent of Hawaii’s food is imported. Pamela Boyer, the Oahu president of an advocacy group for local farmers called Hawaii Farmers Union United, testified Wednesday that the land where Hoopili is slated to be built is the island’s most important productive farmland. “I don’t know how to explain to you how important this parcel is to us for growing food,” she said, noting that the conditions in central Oahu make it more difficult to grow zucchini, broccoli and peppers. But Cameron Nekota from D.R. Horton said the housing project isn’t getting in the way of Hawaii improving its food security. “This idea that we can get to self-sufficiency, and Hoopili is impeding that, is not true,” he said. The issue of farmland aside, supporters point out that there are lots of reasons to back Hoopili. Peter Flachsbart, an associate professor of urban planning at the University of Hawaii, said he leans toward supporting the project because it surrounds the city’s planned metro system. The Honolulu City Council approved Koa Ridge over a year ago despite similar protests from environmentalists. The housing development by Castle & Cooke was a full two miles from the nearest rail station. In contrast, Hoopili would have its own rail station. That’s one reason why Nekota has touted it as an example of smart growth, development that seeks to curb urban sprawl. Nekota also points to the city’s need for housing and the developer’s decision to conserve about 200 acres for farming in response to community concerns. He said the company bought the land because it’s within the city’s urban growth boundary. “We’re just following the plans in terms of how we’ve approached Hoopili,” he said. Councilman Anderson acknowledged the city had probably never heard of “smart growth” when it drew up the Oahu General Plan decades ago. But he said it doesn’t make sense to change course when the city has invested so much money in developing infrastructure in West Oahu. The city’s rail line is already being built on top of farmland where Hoopili is expected to rise. “We can certainly plan future developments with smart growth in mind,” Anderson said.